To some of you this may be new, to some perhaps common knowledge, but I must admit, I get asked these questions quite frequently and figured I’d answer publicly. Can you use your Metro-North ticket on other lines? Is there a ticket that will allow you to ride all of the Metro-North system? I was asked these questions most recently by a coworker (Eric this is for you!). I didn’t think that you could, but I wasn’t 100% sure, and I told him I would get the official word. As for a ticket that would let you ride any Metro-North train, well I didn’t think it existed – but yes, it does in fact exist. Below are two official “Conversion charts” for Metro-North tickets. 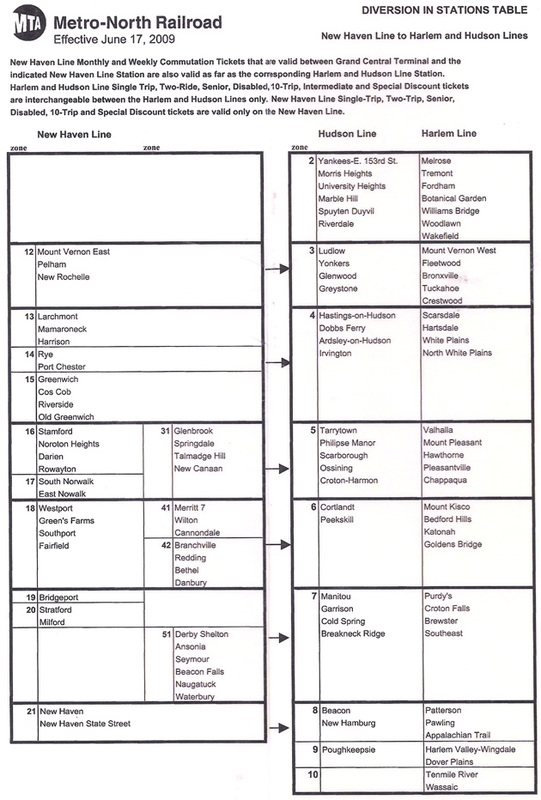 Because the system spans the two states of New York and Connecticut, there are some catches. Any ticket on the Harlem and Hudson lines, as they are both in New York, are completely interchangeable. If the two zones that you leaving and arriving from correspond with the zones on the alternate line, the ticket is valid. My ticket from Goldens Bridge to Grand Central on the Harlem Line would also be valid from Peekskill to Grand Central on the Hudson Line, as both Goldens Bridge and Peekskill are in Zone 6. However, because parts of the New Haven line are in Connecticut, taxes and fees are paid to/by the state for each ticket. If you buy a single ride on the Harlem Line and try to use it on the New Haven, you circumvented that. Thus tickets (with the exception of weeklys and monthlys) purchased on the Harlem and Hudson Lines are not valid on the New Haven. 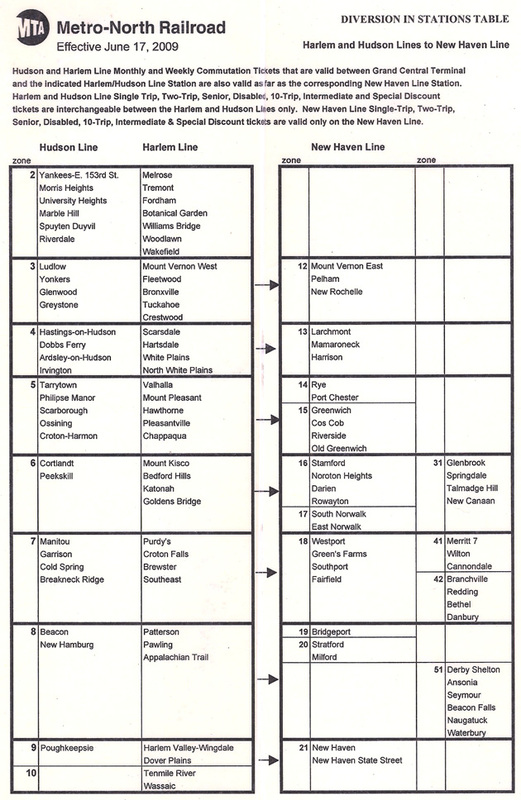 Similarly, ones bought on the New Haven can’t be used for the Harlem and Hudson. But, here’s the catch: It is permitted to use your monthly or weekly from the Harlem and Hudson on the New Haven line, and the other way around. So if you were to purchase a weekly ticket from Wassaic to Grand Central (the furthest fare zones apart) you could effectively ride any train to any location on all three lines for the whole week. Or in the case of the monthly, for an entire month. Thanks for the research, Emily. Its great to know I can travel on the beautiful Hudson line on my Harlem monthly pass. Next stop Tarrytown for dinner with the wife!!! You can also use a Port Jervis monthly ticket on the Hudson Line. A Beacon monthly pass will cover up to Salisbury-Mills Cornwall I believe. Great article – was really confused about this up until now. One question though: I have a monthly from a Zone 5, and want to leave from a Zone 6… do you think the conductor will charge me the difference or make me purchase a full ticket? Get a ticket from in between the two zones (probably comes out to $2.50? ), not the full fare. I do that frequently, my monthly is from Goldens Bridge to White Plains. I then have a 10 trip for White Plains to Grand Central whenever I need it. I just show both tickets. i have spoken to a metro-north customer service representative, and was told that only monthlys and weeklys into Manhattan are now accepted on lines other than the line originally purchased for. has the policy changed? are intermediate monthlys and weekly tickets for the harlem line also accepted on the hudson line? this does not seem to be mentioned in the conversion charts. sorry to bother you with another message. i have been told by customer service that intermediate monthlys and weeklys are valid only between the stops on the line marked on the ticket. have policies changed regarding the interchangeability of tickets between lines since June 17,2009? Terrific article! This was very helpful, useful, and succint. THANK YOU! in the case of the yankee stadium stop, can a one way ticket to dobbs ferry from the stadium also be used to White Plains? I have a monthly from Peekskill to Grand Central. Occasionally I travel between Peekskill and Beacon (2 zones). Anyone know if I can use my monthly pass for this trip? 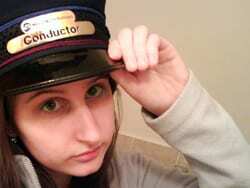 I had one conductor accept it and another tell me no. No, your ticket is only valid up to zone 6.
are Hudson and Harlem line 10 trip or round trip tickets to the yankee stadium stop interchangeable for use on either of these lines?